How does piezosurgery differ from other bone-cutting methods? Piezosurgery, a new bone cutting technique that involves the use of ultrasonic waves, is becoming increasingly common in dental clinics. The handheld device generates micro-vibrations to safely and precisely cut through bone while leaving soft tissues untouched. It can be used in a wide range of dental applications, including oral surgery, implantology, and periodontics. Dental technology has progressed in leaps and bounds over the past two decades. The upshot of these advances is that painful procedures are being reconfigured as minimally invasive surgical techniques with much quicker recovery times. The dentist’s office is no longer a place that needs to provoke fear in children and adults alike. One of the most impressive innovations to emerge is piezosurgery, a novel approach to bone surgery that’s gaining popularity in implantology, periodontics, and oral surgery. The piezoelectric device uses ultrasonic micro-vibrations to cut through bone with impressive precision, avoiding soft tissue completely. An increasing number of surgeons are adopting the approach, as they find it to be safer and less invasive than traditional motorized or manual methods. Piezoelectricity is one of the most fascinating forms of electrical energy. It is generated when certain crystals, such as quartz, are “squeezed” or subjected to mechanical stress. As a result, electricity flows through them, oscillating the crystal back and forth in micro-vibrations. The crystal has a positive charge on one face and a negative charge on the opposite face. When the two faces are connected, the current flows to create an electrical circuit. 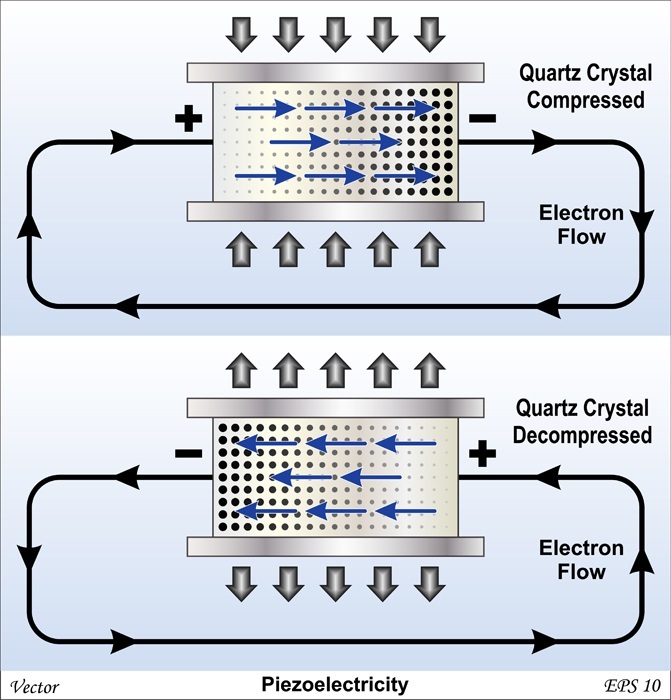 The energy generated by this piezoelectric effect can be harnessed by a device called a piezoelectric transducer and turned into other forms of energy, such as ultrasound. These ultrasonic waves can then be amplified and converted into rapid mechanical vibrations. Piezosurgery devices use these vibrations to create a cutting and hammering movement. The power emitted from the ultrasound can also be adjusted according to different types of bone density. The tip of the device vibrates within a range of 60–200mm, which enables the dentist to cut through bone cleanly with great precision, while the handpiece is equipped with a sterile irrigation system and an LED light for maximum visibility and safety. Low mode is the most appropriate mode for root canal treatments. High mode is most commonly used for cleaning and smoothing out bone borders. Boosted mode is most often used in oral and maxillofacial surgery for osteoplasty and osteotomy procedures. Traditionally, dental surgery that requires manipulation or reshaping of bone has been performed by manual instruments (bone chisels and rongeurs) or powered rotary instruments (rotary burs and oscillating saws). Each have their own specific strengths and weaknesses. Piezosurgery, however, represents a significant improvement on both techniques. Manual cutting devices are more difficult to control when precision is necessary, and are mostly used for rough-cutting larger segments of bone. They require application of high force, which can cause microfractures and damage the bone or surrounding soft tissue. However, they offer good control when small amounts of bone are removed from areas of less density. Trauma inflicted on vascular or neurological structures can occur, causing postoperative inflammation, lockjaw, or bleeding. As such, postoperative use of pain relief maybe be required. Healing may be slowed by surrounding soft tissue trauma, nerve damage, and hemorrhaging. Furthermore, use of force to cut through bone can be stressful for the patient. Mechanical cutting action offers good control for thicker bone density. However, motorized cutting tools can decrease tactile sensitivity, making precision cuts more difficult to achieve. The dentist must be very sensitive in applying force when cutting through bone, and releasing pressure when cutting through less dense tissue. Water irrigation is necessary to offset the heat generated by the instrument, which may damage soft tissue and delay healing in the cutting zone or adjacent soft tissue. Postoperative pain relief may be necessary to treat inflammation. Bone regeneration may also be slowed by physical or thermal injury. In severe cases there may be no bone regeneration at all, even cell death. The loud sound of the motor-driven instrument can be traumatic for patients, causing fear and distress. The ultrasonic device enables micrometric cutting and superior precision, with no bone loss. It is also extremely light, making it easy for the dentist to cut across a flat plane, or in a curvilinear fashion through different bone densities. Surrounding soft tissue remains intact. There is no bleeding, which in turn improves visibility of the operation site. Less collateral tissue damage and bleeding also means less inflammation, an accelerated recovery time, and less postoperative discomfort. Ultrasonic vibrations have the added benefit of stimulating cellular metabolism, and the lack of dead tissue in the cut area accelerates bone regeneration. The device produces significantly less noise than a motorized device and requires no applied pressure, reducing psychological fear and distress. Piezosurgery was created to meet the demand for improved safety and precision in bone surgery. What truly differentiates piezosurgery from its manual and mechanic predecessors is its tissue selectivity: It can target mineral tissue (bone) and spare soft tissue. In many procedures where bone needs to be cut, such as strongly displaced or impacted wisdom teeth, there are often nerves in close proximity. Piezosurgery minimizes any trauma to the nerves, blood vessels, and membranes. Bone that has been cut regenerates more rapidly. Visibility of the operative area is improved due to a blood-free surgical site. The ultrasonic unit can, with limited bone loss, prepare a bony window for easy access to the impacted tooth or root. Piezosurgery requires reduced hand pressure. Operator sensitivity and control is therefore easier, so the clinician can develop a better feel for the micro-vibrations that create the cutting action. Piezo-surgical devices do not heat up with use, meaning no danger of thermal damage to the adjacent tissue. Patients generally experience reduced traumatic stress during procedures where piezosurgery is used to cut the bone. Piezosurgery allows bone cutting and splitting with maximum precision. Piezosurgery allows for easy collection of grafting material, such as bone blocks or bone chips for dental implants. Piezosurgery allows for flat cuts and curvilinear cuts. There is less inflammation following procedures performed with piezosurgery. The patient experiences minimal surgical trauma and rapid postoperative healing. As piezosurgery represents an improvement on older bone cutting methods, there are relatively few disadvantages. The most significant drawback is that the use of ultrasound to cut through hard tissue can be more time intensive than conventional rotary instruments. It involves a steep initial learning curve, as it is a departure from conventional bone cutting techniques. One study showed that surgeons took 35% longer using piezosurgery than mechanical tools. Dense or more compact bones may require the use of more powerful tools. Ultrasonic waves can in some instances be converted to heat, injuring adjacent tissues. However, dentists use water irrigation during piezosurgery to avoid overheating so thermal injury is rare. Piezosurgery can sometimes leave bone debris in the surgically cut margin. The cost of a piezosurgery unit can be cost prohibitive for some dental clinics, meaning the technology is still not widespread. Piezosurgery is versatile and can be applied in a wide range of procedures in which delicacy and precision are required. It can be used in oral surgery, periodontics, and implantology, enabling bone surgery in anatomically complex situations. As a result of piezosurgery, many surgical techniques have been dramatically simplified, with postoperative complications decreasing. For example, piezosurgery is changing the face of maxillary sinus surgery, with clinical studies showing that membrane perforation rates have reduced from 30% to 7%. Piezosurgery improves patient experience. Common procedures such as preparation of a root canal or impacted wisdom tooth extraction are made significantly less intimidating when piezosurgery is used in place of older bone cutting techniques. Better still, healing time and postoperative discomfort are also reduced. If you are due to undergo a dental or periodontal procedure, be sure to ask your dentist if they use piezosurgery. Although the technology is still relatively new, a growing number of dental clinics are including this minimally invasive method in their practice. Rahnama, M., Czupkałło, Ł., Czajkowski, L., Grasza, J., & Wallner, J. (2013). The use of piezosurgery as an alternative method of minimally invasive surgery in the authors’ experience. Videosurgery and Other Miniinvasive Techniques, 8(4), 321–326. Piezosurgery in Dentistry: A Versatile Tool In Bone Management.